TFH Magazine Forum • View topic - Shell Dweller Species? I am planning on going with a shell dweller setup for my 20g long. But I am not sure what species would fit best. One of the LFS has Lyretailed Brevis, but I can also order in one of the following myself - LAMPROLOGUS MELEAGRIS / LAMPROLOGUS MULTIFASCIATUS / LAMPROLOGUS SIMILIS. Any thoughts? Thanks. 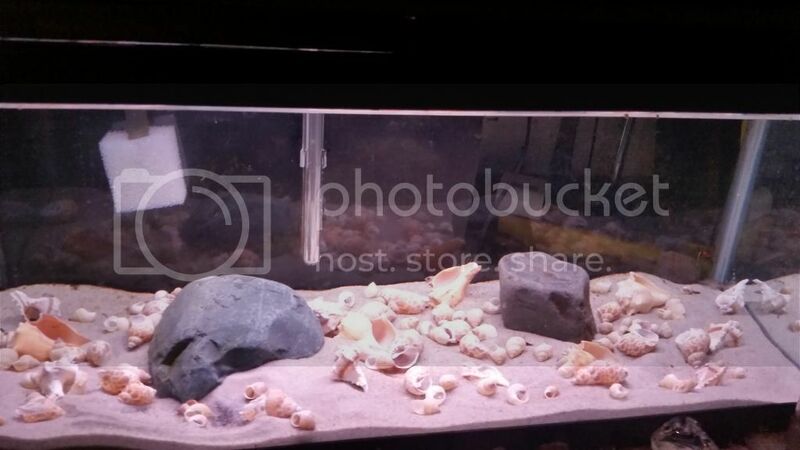 Provide tons of shells, a mixture of sand and small sized gravel and let them do their rescaping! 2 shells per fish, I just dumped 4 big bags of shells in and let them do what they wanted. Some captured as many as they could, others buried, others moved them to other locations. It's the coolest little fish you'll ever own. They hold their own against my full sized Julies and Cyps. I went with 8 multi's afterward, they should be getting in tomorrow. The tank is all set up and ready with lots of shells, though I will be adding more for sure. I will start with 8 then remove any out casts to hopefully end up with one or two pairs. I'll post some pics tomorrow after I get the fish in. Here is a pic of the setup, not sure if I should add more shells or not, let me know what you think. I would add more rocks. Make more distinct areas for the pairs to have some space so they can set up house keeping, and still separate their territory from their neighbor. The neighbourly "interaction" is what makes things interesting. Adding rocks will just mean a pair will move in there to have their broods. In the end, you'll have multi's everywhere. No need to separate for a starter colony, they'll breed like crazy. I started with 13... Yes, that looks like more than enough for 8, but as things increase, so do the shells. And don't bother with Aquascaping. They'll decide what's right and what's wrong with digging and moving. Make sure those rocks are resting on the bottom of the tank. I am glad I did this with mine, as they dug around my piles and a few did shift a bit. All the shellies are still good, feeding a good variety of frozen and flake. Not too much aggression really, they have taken up residence across the tank, but there is a pair holding shells close to one another. Not sure if this may be a potential breeding pair or even a male and female at all. You have a breeding pair. The shells will provide safety for the eggs and new fry. I bet they are shoeing off thing that gets close.